Help your dog eat healthier with the Contech Eat Better Dog Food Bowl. This sturdy bowl features a raised wishbone shape in the center, which helps divide food evenly. This aids in slowing your dog's eating, which in turn will improve digestion and reduce vomiting. 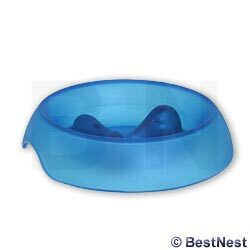 The base has three nonskid pads, to keep the bowl sturdy, and a notch along the bottom allows you to easily pick up and move the item. A stylized image of a dog with a bone adorns the side of the bowl. The blue color adds a fun feel, and the plastic construction will last for several seasons. Help keep your dog healthy using this Eat Better Dog Food Bowl.